Sales have changed so much over the years. About 25% of people are analytical and easy to identify in professions like Accountants, Architects and lawyers. They normally are left brain buyers and interested in facts and figures, very analytical and don’t like to be pushed into a sale. When they say, ‘I want to think about it’, they really do. Give them as much information as you can and preferably with two choices to analyze and they will do their homework and make their decision. The rest of the population are normally ‘right brain buyers’ and need to be sold to in a totally different way. They are ‘big picture’ buyers and do not want to be blinded by facts and figures. The first step is provoking thoughts. We live in a visual society and we can involve them visually with pictures and videos on iPads, iPhones or with a printed visual. Some time ago I was made an appointment with the CEO of a huge company with the goal of running a two-day social media course for them. I did my homework and discovered that this man was rude and ruthless, but passionate about his business. When I arrived, I was directed to the boardroom where there were five of his terrified marketing managers. In my preparation, I discovered that one of his companies sold motor cycles. After he asked me the question, I took my iPhone from my pocket and started looking at it. He looked at me like I was crazy and said ‘you’re not telling me anything new’. I then said ‘What if they could project the presentation onto any surface to demonstrate the motor cycles’ and switched on the world’s smallest projector which was connected to my Iphone and projected the videos. This interrupted his thought pattern and he was mesmerized. Ten minutes later he walked out of the room, the meeting over and I was booked and introduced some great new marketing ideas to his business. 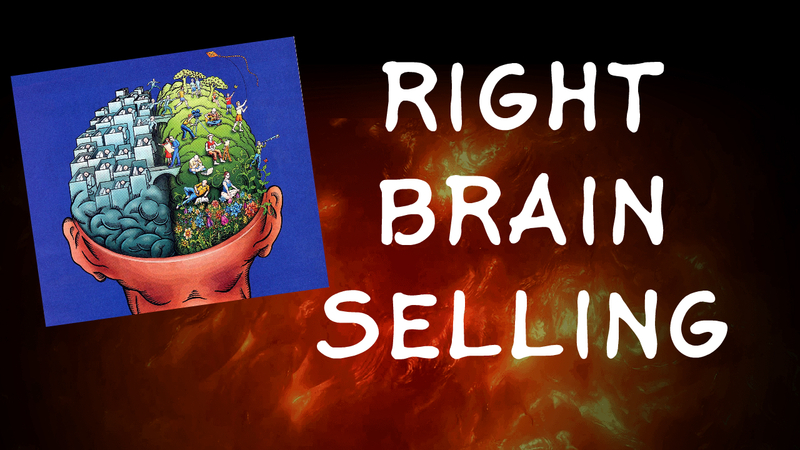 Breaking thought patterns and provoking ideas are essential for right brain buyers. The second step in right brain selling is stirring emotions with intelligent questions. I use four questions which steers me in the right direction for the sale. Here they share what is important and it could vary from service to delivery and many other factors. Sometimes they try to throw me by saying ‘price’ and I say that if price was not a factor, what else is important. My second question is ‘why is that important to you’ and they now elaborate. This is time to listen intently as they are telling you what you should be concentrating on and emphasizing when presenting your product or service to win their business. My third question is asking them about the bad news. ‘What would happen if you chose a supplier and they do not deliver on their promises and give you what is important to you. At this point they get agitated and tell you how badly it would affect them and the negative consequences it would have on the relationship. My fourth question focuses on the good news question. What would happen if the supplier you chose delivers exactly as promised? This again changes their thought pattern and puts them into a positive frame and they share the great things that will happen by choosing the right supplier. My presentation is now focused on what is important to them, rather than the old-style solution, advantage and benefits and typical product or service sale. The third step in right brain selling is storytelling. Everyone loves stories and if you can share real-life stories about how your product or service has helped companies like theirs, they will relate to it and visualize how they could benefit similarly by using your services. The fourth step in right brain selling is reinforcing the relationship with incredible service and delivering on your promises. The next time you go on a sale and you identify a right brain buyer, just try some of these techniques, they work. I have just launched my Sales & Marketing Academy, please take a look. I will also be launching my online ‘Sales School’ in one month. Please email me at frank@frankfurness.com for ‘early bird special discounts’.